¡Las Sandinistas! revela la extraordinaria e inédita historia de un grupo de mujeres nicaragüenses que lideraron las tropas sandinistas rebeldes en la batalla, y luego creó una innovadora reforma social durante la Revolución Sandinista de 1979 en Nicaragua, y que continúa liderando movimientos populares por la democracia y la igualdad en la actualidad. 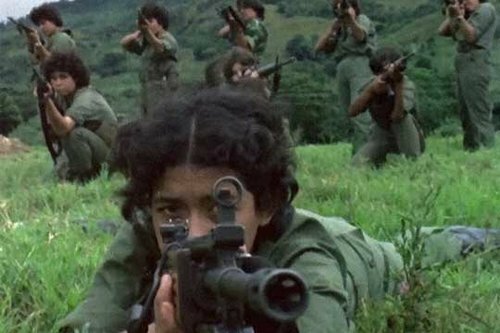 ¡Las Sandinistas!​ reveals the extraordinary and untold story of a group of Nicaraguan women who  led rebel Sandinista troops in battle, and went on to create groundbreaking social reform during  Nicaragua’s 1979 Sandinista Revolution – and who continue to lead popular movements for  democracy and equality today. Directora, editora, productora. Jenny es graduada de la Universidad de Columbia en Nueva York, donde estudió cine latinoamericano, filosofía y fotografía. Dirigió tres cortometrajes y varios videos de comedias de sátira social, que han aparecido en twitter por la crítica de televisión Emily Nussbaum de The New Yorker. Su cortometraje narrativo más reciente fue seleccionado para la pantalla de Anthology Film Archives en la ciudad de Nueva York como parte de New Filmmakers New York Winterfest. Estudió método de actuación en el Instituto Lee Strasberg en Nueva York, trabajó asistiendo al cinematógrafo Fletch Murray, galardonado con un Emmy, y fundó un colectivo femenino de cine en Los Ángeles. Director, Editor, Producer. Jenny is a graduate of Columbia University in New York  where she studied Latin American Film, Philosophy, and Photography. She directed three short films, and  multiple social satire comedy videos, which have been featured on twitter by television critic Emily  Nussbaum of The New Yorker. Her most recent short narrative film was selected to screen at  Anthology Film Archives in New York City as part of New Filmmakers New York Winterfest. She  studied method acting at Lee Strasberg Institute in New York, worked assisting Emmy-award  winning Cinematographer Fletch Murray, and founded a women’s filmmaking collective in Los  Angeles.